Summary: The hidden truth about ice cream. Station: WTAE Channel 4 Reporter: Paul Van Osdol When It Aired: July 7 Running Time: 4 minutes, 25 seconds Visuals: * A microscopic view of the dreaded coliform bacteria that could make someone get sick -- even though we have not a modicum of proof from this "investigation" that anyone has. 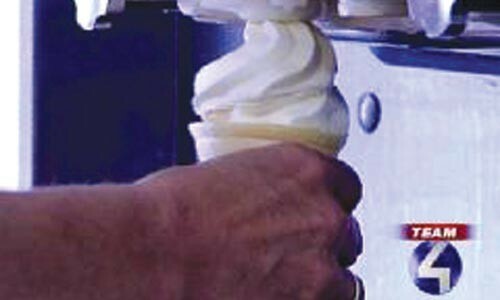 * Deceptively innocent-looking, soft-serve vanilla ice cream being dispensed from a machine. Highlights: * When Van Osdol references some tests, which showed "coliform bacteria levels more than 10 times the state limit. That same bacteria commonly contains E. coli. Now there's no indication any dangerous strain of E. coli was found in these tests, but experts tell me too much of the less-toxic bacteria can still make you sick." * When Van Osdol reminds us, "In summertime, everyone loves ice cream -- from big dogs to little girls," but then changes gears: "The state requires monthly bacteria tests for all ice cream coming from soft-serve machines. Two failing inspections in four months gets a warning letter, and a state inspection that could lead to fines. 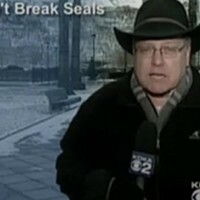 Team 4 found since January 2007, the state has sent out 40 warning letters to restaurants and ice-cream parlors in Allegheny County, and some of those places were later fined for failing more inspections." * When a state inspector says, "You could basically have the possibility of giving some of the customers, depending on their own health -- they could get diarrhea. They surely could." * When Van Osdol makes the startling disclosure, "It's unclear whether that's happened locally. Even though inspections are posted on the Agriculture Department Web site, customers we talked to were not aware their favorite ice-cream shop had failed bacteria tests." * When a woman responds to the news of "high bacteria count" -- "Wow, I had no idea." * When the franchise owner of an establishment that received to warning letters in four monthly tests "explains": "Human nature, you make mistakes. Like I said, kids sometimes ... even ourselves, maybe we're not as careful as we should be, you know, with changin' the bags and things like that." * Van Osdol: "Inspectors say the best way to prevent bacteria is to clean these soft-serve machines every day, as the law requires." What We Learned: This story about ice cream may be the worst scoop of the summer. Unanswered Question: Can I have rainbow sprinkles with that? News Value: 1. And staring at the sun too long could make you go blind.